Using affordable or budget computer speakers doesn’t automatically mean lower-quality sound or minimal performance. Finding the right affordably-priced speakers for a MAC or PC can be the key to delivering high-quality music and any other kind of computer audio. Find many different options and choices in computer speakers on a budget, including speakerphone capability, USB, wireless, and wired connectivity. PC owners can select the Jabra Speak 410 UC Speakerphone which offers HD Voice technology for video and audio conversations. 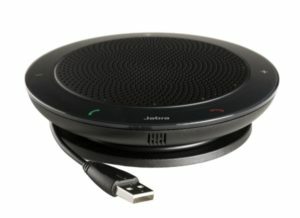 Jabra’s plug-and-play functionality enables easy connections with all brands of PC. Integrated USB cable management and a travel case allow owners take the speakerphone anywhere they need to go. Headsets are easy to connect with a built-in 3.5 mm port. At only 12 ounces, the Jabra Speak 410 is also lightweight and features a sleek round design. At slightly more than 16 inches long, the slim Elegiant Sound Bar offers a simple USB plug and play set-up and high levels of sound that can fill a room. 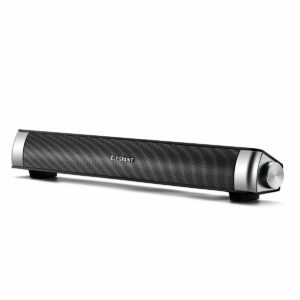 USB power and battery charging make the Elegiant Soundbar easily portable. The Elegiant Sound Bar’s design fits easily on any desk or shelf and it will work with a notebook or laptop and smart TVs. Dynamic stereo sound output works via the soundbar speaker and through headphones. 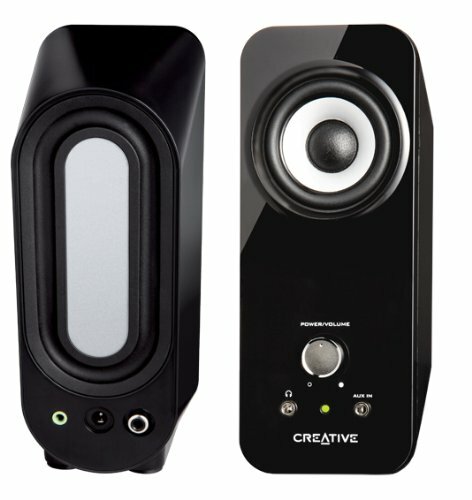 Offering high-quality drivers, the Creative Inspire T12 Multimedia Speaker System offers a full range of stereo audio for computers and MP3 players. The Creative Inspire T12 has BassFlex technology which supports low-frequency output and is perfect for bass-heavy music fueling parties or dancing. The 3.5mm auxiliary jack supports connections to MP3 players and gaming headsets. 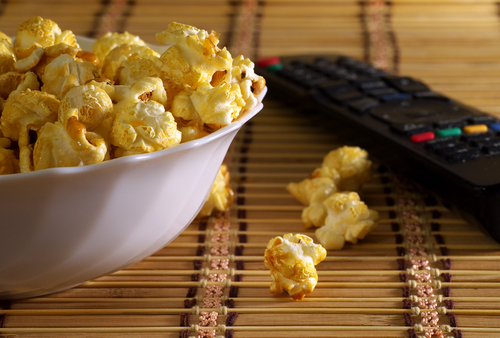 The Creative Inspire T12 also works with HDTV sound to boost viewing or gaming experiences. Logitech’s Z333 2.1 speakers have 80 watts of power at peak usage to fill any room with clear, powerful audio. The wired control pod helps you easily access power and volume, and Logitech’s front-facing sub-woofer offers bass sound for gaming, music and video entertainment. The Logitech Z333 2.1 speaker set works with MP3 players, laptops, desktops, and smartphones, tablets, and gaming systems. Edifier’s black and gray 2.0 USB computer speakers weigh less than 12 ounces each and are a compact 3.2 inches wide by 6.8 inches tall. The speakers provide a full range of sound and their 10 degrees of tilt allows amplification from the desktop as well as the unit itself. 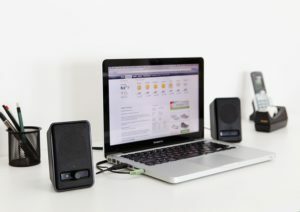 Edifier’s twin speakers connect to the computer with a single USB cable and will work with computers, tablets, smartphones, gaming systems, and other devices using a 3.5mm auxiliary connection, including headphones. 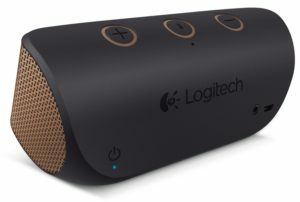 Whether you are looking for PC computer speakers or Mac computer speakers, Logitech’s extremely compact, powerful USB speakers will work directly from the computer. They have convenient, easy to use controls and have a 3.5mm input jack for MP3 players such as the iPod or iPod shuffle. Logitech’s sleek silver and black design will fit on any shelf or desk delivering sound power with ease. The lightweight and high-tech design of Logitech’s X300 mobile wireless speaker delivers stereo sound through Bluetooth technology. At about 13 ounces, the speaker is lightweight, ultra-portable, and offers precision audio performance in bass and treble ranges. The built-in microphone allows you to use the X300 as a mobile speakerphone. Logitech’s cordless stereo sound in a black and copper package lets you take music with your laptop, smartphone, and other devices. The wireless Anker Classic speaker is completely portable, with 20 hours of playtime on a single battery charge. 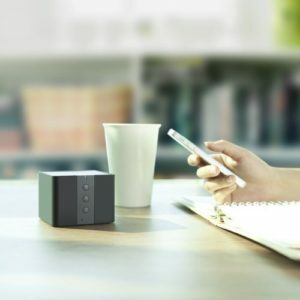 The Bluetooth speaker will work with any Bluetooth capable PC or Mac, as well as smartphones and tablets with Bluetooth. The square design offers easy exterior volume controls and powerful stereo audio coming from the all-in-one device. The Anker Classic is also a speakerphone with a built-in mic and a connection range of up to 33 feet. Designed to work with multimedia PCs and deliver clear, strong audio for music, movies, and gaming, the Cyber Acoustics 2.1 computer speaker offers strong performance at lower frequencies. 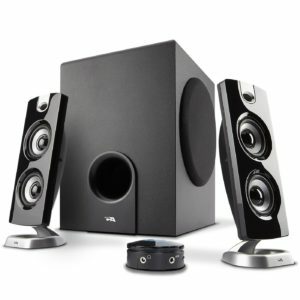 The three-piece system has 62 watts of power and includes a subwoofer in its own wood cabinet. With a headphone output jack and 3.5mm input jack, you can connect smartphones, tablets and gaming systems for flexible use. 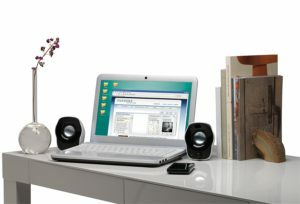 AmazonBasics twin speakers connect to your PC or Mac computer system via a USB port for power and sound. A clean, simple design will fit well on a desk or shelf and power supply is indicated by an LED display. Lightweight and portable, the twin speakers offer a simple and easy plug-and-play set up to deliver stereo sound and functionality for work, play, or portable party sound. Affordable speakers for a PC, Mac, notebook, netbook or laptop come in many shapes and sizes. 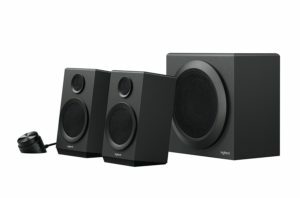 Whether you need speakers to deliver stereo sound for your laptop or desktop for work, or want to listen to music or power a party, you can choose from budget computer speakers that offer sleek designs, compact sizes, and USB or Bluetooth connectivity.